With the rise of technology, more and more people are using tablets and phones on a daily basis, which leads to having less freed up sockets in your home or office. One practical solution to free up your sockets from space consuming bulky USB chargers is a USB charging station. Furthermore, it only requires one socket to charge all your USB devices. As we have reviewed many different charging stations, today we are presenting you the top 7. Smartphones and tablets usually come with a charging cable and power brick. Those included accessories tend to get misplaced or cluttered with other cables at home or at the office. That’s why having a charging station is convenient and are a must these days. Especially if you have more than one gadget or someone who belongs to a family that uses numerous devices on a daily basis. So, if you’re looking for that ideal and perfect charging station for your needs, then check out our list of top 7 charging stations. Besides having the smooth and elegant design, Okra comes with 2.0 Quick Charge option which allows you to charge your devices up to 75% faster than standard chargers, without the fear of overheating. It has 7 slots with anti-scratch non-slippery silicone pads which can charge ANY device that supports USB charging, whether it’s a phone, tablet, mp3 player, or e-reader. 5 slots are 2.4A and 2 slots are 2.0 Quick Charge. This tablet station has Smart IC chipsets in all the ports, which are used for recognizing the device and delivering safe charge. As you can see from the picture, buying this device would imply that you have various devices with different sizes. For example, 8 slots on this station are ideal for charging phones and tablets, while the other 2 can be used for charging smaller devices, such as Bluetooth earphones or a smartwatch. The deck is non-slip padded, which keeps your devices secure from slipping away. Also, Siig has a LED ambient light which makes it easy to use at night. This one is a bit different. You can’t actually put devices on it, but it’s great in another way. At first, it is small and convenient to use for home and office, or even for traveling. The disadvantage is that it doesn’t support a Quick Charge option, however, it uses some smart technology to make sure you get the speediest charge from the ports. Can be quickly attached to a wall, or a table. 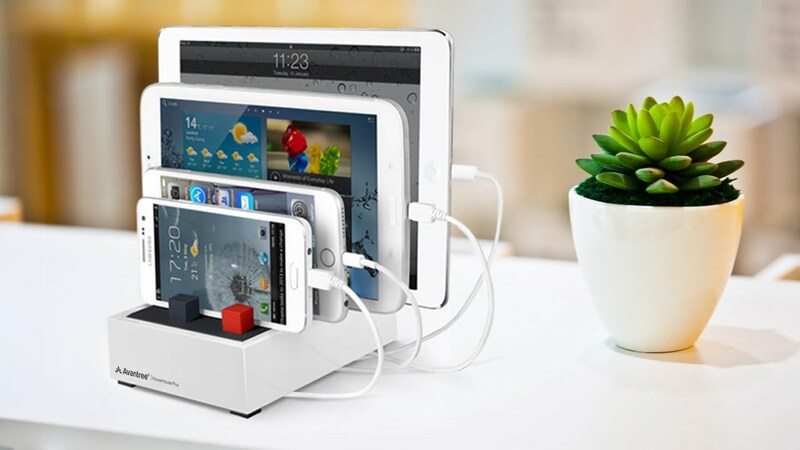 This is a very compact, elegant and nice looking charging station, and also very useful. It has 6 USB slots with 2.4A and will charge your devices at full speed. Besides that, it supports input of 110V and 240V, which makes it available for use anywhere in the world. It also features overheating protection as well as overcharging or short-circuit. It comes with a small LED indicator which shows if the device is properly connected. The interesting thing about this charger is that it allows you to make custom slots. Each divider is detachable, which allows you to set custom width to the slots. With the charge power of up to 2.4A per slot, it ensures that your devices will be charged quickly. Built with highly durable materials and anti-slip bottom, this nice looking round charging station uses smart technology to identify the connected device and deliver the right power, up to 6A! Basically, you can charge any device that supports USB charging, on this station. Like RAVPower, it’s compatible for both 110V and 240V input meaning that it can be used anywhere in the world. Also, it has a LED indicator to show if it has been properly connected to the power source. This station uses StandCharger technology which detects the device you plug in and delivers the right amount of power. It has no fan, which makes it one of the quietest charging stations. Still, it has protection against overheating and overcharging, even when working at high voltage. Compatible with different input voltages, it can be used in any country. All the ports have 2.4 Amps output, which is great! Quick Charge – a very useful feature which can charge your devices up to 75% faster. Wireless Charging – maybe you don’t have a device that supports that feature, but since it’s being embedded in many new devices, there is a big chance that your next phone will support it. Therefore, it can be a good investment. Smart Technology – a charging station should be able to detect your device automatically, which will prevent any possible overheating or overcharging. This is a must-have feature. LED Indicator – it’s both nice and useful to have a LED indicator which indicates if the device is full or still charging. It can also show if the device is attached properly. Input Power – some people might not need that, but if you often travel to different countries, it can be very useful to have different input power supports (for 110V and 240V). Compactness – before buying, think about whether you would use it at home, at the office, or near your bed (which is not ideal if having a loud station). Also, if you travel often, it should be compact and easy to carry. If having a charging station that requires USB cables doesn’t fit your taste, then check out this wireless charging station called “Unravel” by Ampere. The Unravel by Ampere is a wireless fast charging station that started from a crowd-funded project on Kickstarter. The key features of the Unravel is its foldable functionality and it’s the only wireless charger with omni-device pads. It also features USB-C PD which is the best thing about USB devices as of the latest. Charging stations are designed simply for convenience and the ease of organizing USB cables. Ultimately, the best charging station comes down to certain preferences. If it’s going to be for home use, then personal preference will matter. On the other hand, convenience, quality, and ease of use will matter most for offices. For us, a slow charging station is a big no. Especially with the latest generation of smart gadgets. They feature bigger batteries and more powerful hardware which ultimately requires more power. That’s why a fast charging station is a must for us. Which one of these charging stations seems the best to you? Please let us know in the comments below!